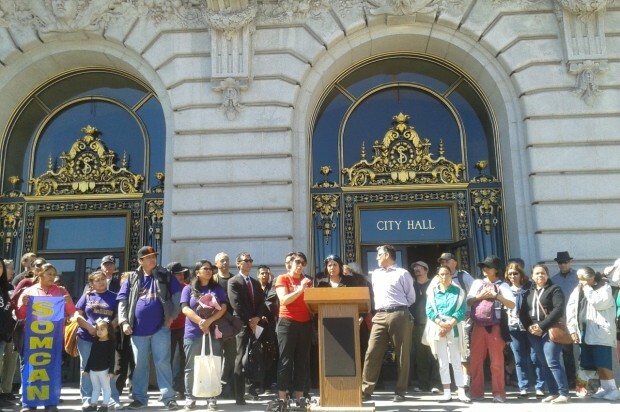 Tenants facing eviction rallied with San Francisco city supervisors on the steps of City Hall today in support of legislation introduced by Supervisor David Campos designed to dampen the impact of evictions via the state’s Ellis Act. The rally was held before a hearing on Campos’ legislation, which would tie compensation for relocation assistance for evicted tenants to market rates, rather than the fixed amount in current law, Campos said. “Our folks need a strong safety net,” Causa Justa activist Maria Zamudio said at today’s rally. Campos said the city is powerless to close what he called a “loophole” in the state’s Ellis Act—statewide legislation passed in 1985 that permits landlords to evict tenants from buildings that they plan to withdraw from the rental market. Critics charge that property owners are using the Ellis Act to evict rent-controlled tenants from their homes in order to repurpose the building as condominiums or sell the building at a large profit. Campos’ legislation was discussed at a Land Use and Economic Development committee hearing immediately following the rally. Campos explained that under the current law, landlords must pay tenants between $5,265 and $15,795 in relocation assistance when they are evicted under the Ellis Act. But under the proposed legislation, relocation assistance would be tied to the market rate of the unit as determined by the city controller’s office. Ted Egan, chief economist at the city controller’s office, used the example of a two-bedroom apartment in the Mission District that was occupied for 27 years and might be rented for $909 under rent control. If such a tenant were evicted, Egan said, that person would be due the difference between their rent and what the market rent of the unit would be, determined by the city’s formula to be $1,868. The landlord would be required to pay two years’ worth of that difference, a total of $44,832, Egan said. “It gets to the root of what’s troubling this city,” said Supervisor John Avalos, who appeared at the rally with Campos and Supervisor Eric Mar today to express support for the legislation. “Greed and speculation is driving us out of our homes,” Avalos said. Supervisor Jane Kim, a member of the housing and land use committee, said at the hearing today that she is co-sponsoring the legislation. Supervisors Scott Weiner and Malia Cohen, the other two members of the committee, expressed support for the intent of the law but had questions about the details of its implementation. The ordinance is the latest in a series of reactions by the Board of Supervisors to citywide rent increases and an increasing number of Ellis Act evictions. Realtor groups are challenging in court two measures that went into effect this year. Both laws set limits on how and when property can be repurposed after tenants are evicted under the Ellis Act. Critics at today’s committee hearing said that the restrictions on Ellis Act evictions can harm “mom and pop” landlords by creating an undue burden on property owners that own only one or two properties and are not reaping massive profits. City officials said that there are provisions in Campos’ proposed legislation that could make exceptions for landlords facing financial hardship, including a possible reduction in the cost or a payment plan to pay the assistance over a period of time at the discretion of the city’s rent board. But another critic speaking at today’s meeting said that the way hardship was determined was not equitable because the rent board examines total assets when assessing landlord hardship but not for tenants. 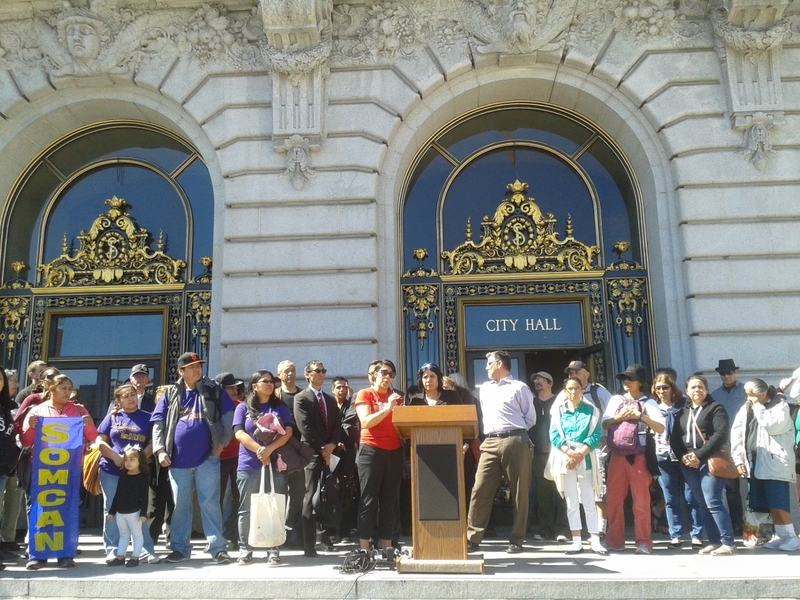 Several tenants facing eviction spoke at today’s rally. Blanca Reyes, a 24-year resident of the Mission District, said her landlord has offered her buyouts to vacate her lease, but that she does not want to uproot her family. She said she is concerned that other Hispanic people facing eviction could be afraid to fight the evictions, particularly people who might be undocumented and afraid to come forward. Patricia Kerman, a Mission District resident for 27 years, said she has gone from living in a neighborhood that people she knew were afraid to visit to a rapidly gentrifying area with rising rents. Her landlord, she said, previously neglected her building to the point that he would not fix her front porch light when she first moved in. However, since the neighborhood has been booming, he has threatened to evict her under the Ellis Act.